For tropical cities in warm climates or temperate climate, the Urban Heat Island (UHI) increases and the use of energy for air conditioning increases in the summer time. Increase in usage of air condition increases emissions of greenhouse gases. Higher urban temperatures lead to formation of urban smog in the atmosphere. At night when the temperature is high in the areas, the UHI effect exacerbates heat stress. 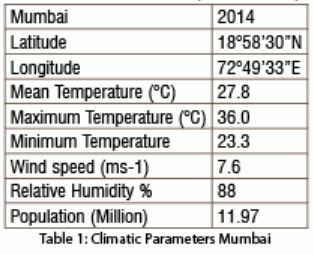 High-density compact cities on the coast like Mumbai suffers a lot with increase in humidity levels and heat stored in the buildings during day time and emit in the night time. Because humidity is in atmosphere, the transfer of heat is minimal, which creates adverse conditions for the inhabitants of the city. Area covered with concrete surfaces of urban land mass with high thermal capacity and urban heat island intensity (Oke, 1973). Mumbai is a suitable study area of an Asian city in tropical climate. It has witnessed extreme urban agglomeration with one of the highest population density globally. Mumbai is the capital of Maharashtra with population above 20 million, situated at coordinates (18°58’30” N, 72°49’33” E).It is situated at the middle western coast of India and has a deep natural harbour and coast on western and southern side. The city district region is also commonly referred to as the Island City/Mumbai City or South Mumbai. The island city spans 67.79 km2. While the suburban district spans 370 km2, together accounting for 437.71 km2, under the administration of Municipal Corporation of Greater Mumbai (MCGM). The remaining area belongs to Defence, Mumbai Port Trust, Atomic Energy Commission and Borivali National Park, which are out of the jurisdiction of the BMC. Mumbai has amongst the highest population density in the world which is estimated to be about 52,209 people per Sq. Km (Census 2011). USGS/NASA Landsat-8 Enhanced Thematic Mapper Plus (ETM+) satellite data was used in this study. Landsat-8 ETM+ images obtained on 6th January 2014 and12th April 2014. The processed images were geo-referenced using WGS84/UTM projection system. Emissivity is the properties of urban materials, in particular solar reflectance, thermal emissivity, and heat capacity, which also influence thermal conditions, as they determine how the sun’s energy is reflected, emitted and absorbed (Akbari et al.,2010). The emissivity of land is significantly varies with the heterogeneity of vegetation, surface moisture, roughness, and viewing angle. NDVI is known as Simple Ratio (SR). SR can be calculated using the reflectance of the near infrared band (NIR) and is the reflectance of the red band (red). The Normalised Difference Vegetation Index (NDVI) is the most commonly used vegetation index. For dense vegetation, this ratio will be high, due to the inverse relationship between vegetation brightness in the red and infrared regions of the spectrum. NDVI images were obtained with the help of Raster calculator in ArcGIS. The images obtained were having values ranging between -1 AND +1. Values closer to 1 represent dense vegetation whereas value closer to -1 represents water or soil. Proportional Vegetation is represented by Pv and it deals with the association between the amount of vegetation present within a pixel and the pixel’s emissivity. There have been some studies regarding the relationship between NDVI and percent vegetation cover (Valor and Caselles, 1996). Proportional vegetation was evaluated using the equation. NDVI gives the live green vegetation presence in each pixel of raster image and thus, gives some measure of surface composition which can be applied for obtaining emissivity values. Pv is the vegetation proportion and it deals with the relationship between the amount of vegetation present within a pixel and the pixel’s emissivity. lower values of Pv indicates built up or bare land and higher values indicate vegetation, whereas water and soil lies at the median of the range. It, thus, gives the potential of surface materials to emit radiation. This measure contributes in reducing the error of land surface temperature computation and assures the values to be closer to ground truth. Ts represents the land surface temperature, T10 and T11 represent the brightness temperature for channels 10 and 11respectively, M and N are the coefficients determined by the impact of atmospheric conditions and other related factors on the thermal spectral radiance, and its transmission in channels 10 & 11. Further, the effect of urbanization and concretization at local scale showing the difference in temperature in less vegetated and more vegetated land is also studied. It is found that the conventional rooftops are about 3-4°C higher as compared to green and garden roof or roof covered with vegetation. 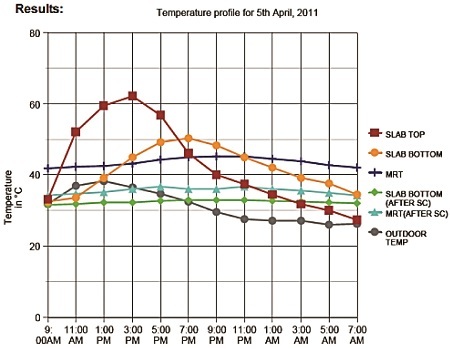 Conventional roofs absorb maximum amount of solar radiation during day time. It can be seen that the temperature of the region having more green (vegetated) area falls to lower scale as compared to the area having less green space and more concrete area. It can be said that the presence of vegetation reduces the overall temperature of the area both at regional and local scale. With the help of Thermo IMAGER TIM 160 is used for the city to map some buildings material and surrounding areas. Thermal images of structures and greenery at various locations of Mumbai like Parel area are captured. 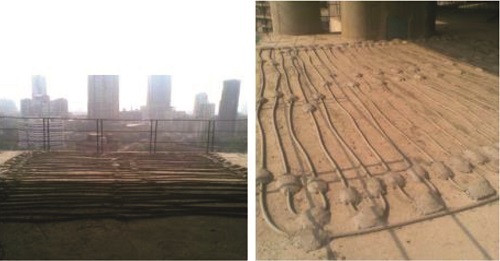 With the help of Thermo IMAGER TIM 160 software the analysis of the images is carried out to find out the effect of concretization in Mumbai, on the local temperature conditions. In this image, the temperatures of horizontal surface or terraces are around 50°C and temperature of grass /vegetation 30- 34.5°C. With the help of these images, we can also see that the greenery in the region helps in reduction of temperature and so the wind profile and other climatic factors associated with temperature. It is found that the roof tops and roads are about 12-15°C higher as compared to green spaces having vegetation. Even the barren surfaces also emit the same radiation as concrete surfaces. It can be seen that the temperature of the outer region of the city having more green (vegetated) area falls to lower scale as compared to the area having less green space and more concrete area. A model of a residential building in Mumbai is taken to demonstrate the case. Palais Royale is a high-end residential apartment in Mumbai. Evaluation of the results of solar load from simulations was done using Energy Plus software. The data so obtained was evaluated and innovative systems for reduction in load, coupled with high efficiency refrigeration systems that cut down the energy demand were proposed and installed. The entire exercise aimed at enhancing the feeling of thermal comfort to the occupants using minimum amounts of energy or water, mostly by natural means as well as throwing the heat content is less in the atmosphere which will help in reducing the temperature. 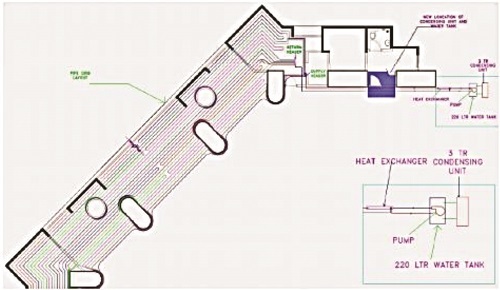 The current system works by pumping chilled water through a loop of plastic pipes (4 loops, each of 100 meters) embedded in the floor slab using a small pump. • The water absorbs the structural heat (solar load) from the floor slab and rejects the same to the refrigerant of the condensing unit through a water refrigerant heat exchanger. • After rejecting the structural load (solar load) to the condensing unit through a heat exchanger, water is re-circulated through the same loop of plastic pipes again to absorb the structural load. • Thus, the cycle repeats, resulting in continuous extraction of the structural load. • In order to prevent the floor top temperature from falling below 30°C, the pump will stop, thus stopping, water from being circulated through loop of pipes encased in the bedding of floor. Considering the thermal capacitance of the roof, which causes delay in the peak outdoor temperature to reach the inner surface, only the peak roof bottom value occurring after the peak roof top value has been taken into calculation. With this system the proposed air conditioning load of 2484 TR reduced to 1711 TR for the whole building. 4.2 In hot humid climates radiant slab cooling requires some special measures. To prevent condensation the supply air requires dehumidification. The temperature of water for cooling coil should be reduced to about 6°C, and also dehumidification of air is required. 2. 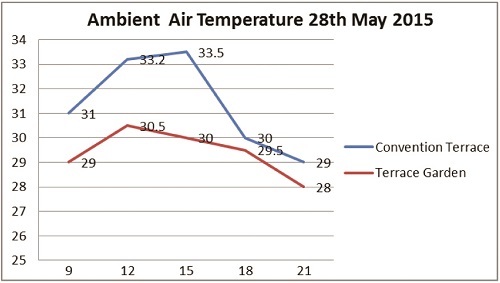 Due to condensation risk natural ventilation without combined control is problematic for radiant slab cooling. The building should be air tight. 3. Due to solar radiation heat gains should be kept low, specially, in glass structures so that the temperature of chilled water supplied to the radiant slab can be increased, which reduces the possibility of condensation. Performance of radiant cooling with outdoor air system is better than conventional VAV Systems. The reduction in air-conditioning load, in warm and humid climate, by structural cooling is possible. PVC Pipes laid on the terrace at 10 cm away and water is flowing at a very less speed to absorb as much heat as possible. This water can be used either in firefighting tank or cool it with the help of cooling tower. It can be seen that the temperature of the areas with different landcover like concrete, Marble, Kota stone, bricks cement tiles and Shabad (a type of stone in India) is increasing with the increase in the urban areas. Thus, use of Structure Cooling judiciously across various surfaces will directly help reduce effects of Urban Heat Island. Same effect will be there on all the horizontal surfaces in the city like footpath, pavings, parking lots, roads and concrete roads. Increase or decrease in Land Surface Temperature depends on many factors such as anthropogenic heat, percentage of surfaces in the city, land cover and city layout. 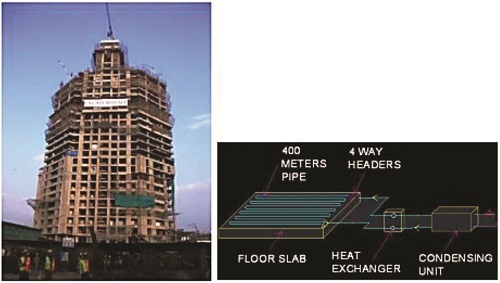 The UHI pattern is highly related to land cover and land use in Mumbai and is also determined by the quantity of vegetation and impervious surface. 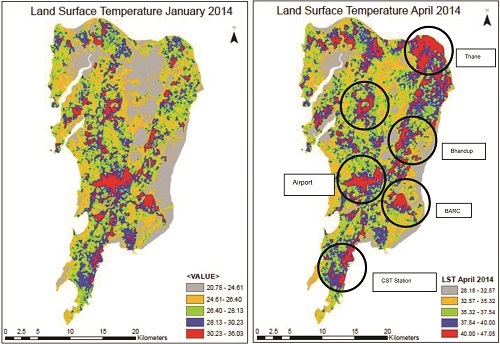 Landsat Images of January 2014 and April 2014 from remote sensing process derived thermal data from the Landsat TM sensor for locating large-scale structures and parks which are the contributing factors of heat in the city. The temperature patterns are seen in the city and found out the micro pattern and local pattern needs attention in planning. Lakes, water bodies surrounded by vegetation reduce the temperature, which gradually increases as land cover changes in areas with more of impervious surface. 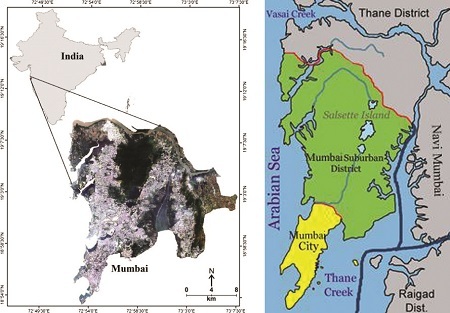 The UHI pattern is highly related to land cover and land use in Mumbai and is also determined by the quantity of vegetation and impervious surface. 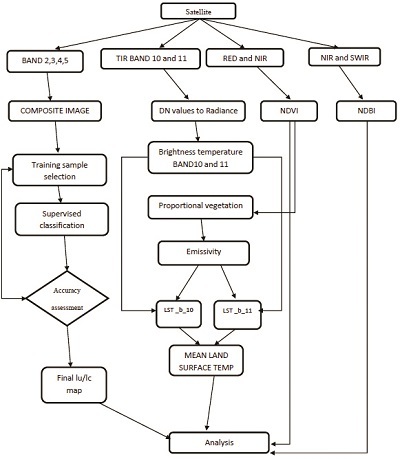 Images 2014 from remote sensing process derived thermal data from the Landsat TM sensor, for locating large-scale structures and parks which are the contributing factors of heat in the city. Our planners have to think to change the land use patterns and land cover in the city, all the terraces should have a use of Structure Cooling system to reduce the temperature of the buildings and its surroundings by reduce the usage of air conditioning systems in the buildings. A mandate/policy in this regard is the need of the time. Making different choices about this use for construction and the configuration can reduce urban heating and reduce the demand of air conditioning. With the help of these results our planners can implement mitigation techniques, which would have the greatest immediate effect at the neighborhood scale by reducing temperature of Micro Urban Heat Islands to make it sustainable for the citizens. Authors are from IIT, Mumbai.